Pat Woodbridge was my special guest this week. Pat is the mother of Jayson Woodbridge, our friend who is Proprietor/Winemaker of Layer Cake Wines and famous for his cult wines Cherry Pie and Hundred Acre. Pat was charged with the mission of assembling all the paperwork and legal documents in order to form this foundation – a process which took the better part of a year. 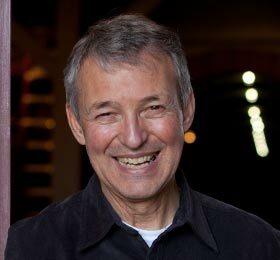 Pat was kind enough to take time out to be a guest on the WineGuyMike™ Radio Show© and share the Charity Case Wine story with you and I.
Charity Case Foundation was formed in 2008, during a difficult rainy vintage in Napa wine country. When fruit is picked after rain, there is more moisture in the soil, which results in the plants absorbing the water into the grapes. In order to correct the dilution, winemakers will remove juice from the fermenters to concentrate the remaining solids before fermentation begins. 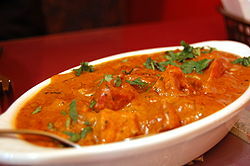 This is called Saignee (French for ‘to bleed’). In 2008, there was a lot of it around. Jayson Woodbridge and Helen Mawson of Hundred Acre, Layer Cake, and Cherry Pie wines contacted other vintners in the Napa Valley area to see if they would donate the juice in order to create a wine which could be sold for the long term support of Napa Valley Charities. The response was overwhelming with dozens of vintners contributing almost more than could be handled. 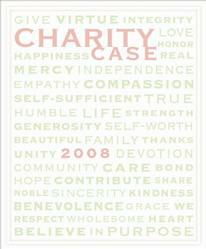 The Charity Case wine label was designed and the non-profit wine with all volunteer help from Napa Valley was launched. In 2008 and 2009, a Napa Valley Rose blend was created from several varieties of red grapes from in and around Saint Helena. 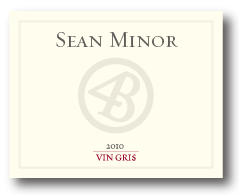 In 2009 the group found exceptional Sauvignon Blanc grapes in St. Helena that needed a home. In 2010, a group in Napa Valley donated 10 tons of Chardonnay and this Charity Case Wine will be released very soon. Once Pat had everything in place, she joined forces with Helen Mawson, Jayson’s partner and fellow winemaker, Sheila Dougherty, a veteran of charity work and manager of the Wolfe Center, a treatment center for teens with addiction problems. The fourth member of the troop is Peggy Garcia, executive assistant for Jayson, who heartily threw herself into the fold. The four of them have worked tirelessly for Charity Case Foundation. All services are volunteered, and all net proceeds go to the charities. WineGuyMike™ Radio Show© friend Laura Kirkham and her Laura Kirkham Agency joined the group in October of 2010, offering pro bono public relations assistance to tell the Charity Case story. 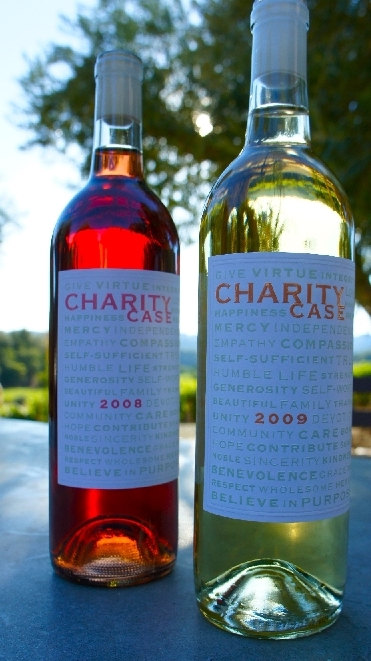 The Charity Case Foundation is devoted to raising funds through the sale of small-production, specially crafted wines to support local non-profit organizations, providing services to children in need and their families. The Foundation’s motivating philosophy is to get all monies raised to those in need, without dollars spent on marketing, bureaucracy or other hidden expenses, which take away from getting the donations – in their entirety – to those who actually need them. The wines, labels, bottles, corks storage, shipping and marketing efforts for The Charity Case Foundation are done entirely by volunteers. 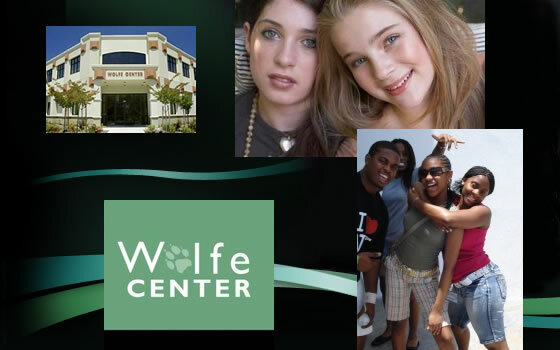 Charity Case has no salaried employees, meaning that all of the proceeds go directly to the charities. Who are this year’s recipients of proceeds in their entirety raised by The Charity Case Foundation? Before I get into the wines for today’s show I would like to give a shout out to all the Father’s out there and say Happy Father’s day to you. I want to also share a personal thought with you today. I strive to follow the example of the great folks at Charity Case Foundation and think about serving others, please join me in this mission. 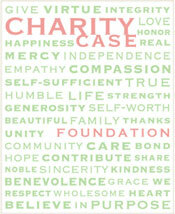 I want to thank the Charity Case Foundation for all that they do. Please join me and raise your glass in a toast to Pat Woodbridge and all the other good people involved in the Charity Case Wine and Foundation, Salute. Check out the radio show on The Trail 103.3FM and Fresh 104.5FM. The live stream feed is online at www.trail1033.comwhere you can click on “Listen Live”. The WineGuyMike™ Radio Show© airs on both radio stations Sunday mornings at 10:00AM MST.Check out the radio show on The Trail 103.3FM and Fresh 104.5FM. The live stream feed is online at www.trail1033.com where you can click on “Listen Live”. The WineGuyMike™ Radio Show© airs on both radio stations Sunday mornings at 10:00AM MST. This week on the WineGuyMike™ Radio Show© I’m talking with Justin Vajgert who is National Brand Sales Manager for the Reininger and Helix wine labels. Today I’m going to share with you the land, the wine, and the man who makes these wines. First I want to give you a little background on my guest who joins me this week on WineGuyMike™ Radio Show©. Justin’s background is a similar journey of most guests I have the pleasure of talking with on the show. Justin grew up just outside of Chicago and relocated to the Walla Walla area in 2005 to attend the Institute for Viticulture and Enology. He worked harvest in 2005 for the Waterbrook Winery and then joined forces with the Reininger Winery in November of 2005. Justin worked at Reininger all through school doing everything from cellar work, to pouring wine in the tasting room, to painting bathrooms. During Justin’s tenure his roles have evolved and he moved into a sales role beginning with local sales and then after school moved into his current national sales position. He’s been doing that ever since. Distribution for Reininger/Helix has grown to 17 states. Justin eventually wants to make wine though, it’s his passion. It's all business at Reininger Winery, just kiddin'. Fun and great Wine. The backbone of the winery side of this business is not the glam we consumers experience when we do a road trip to visit the wine country. We walk into the beautiful tasting room and are greeted by nice smiling people eager to tell you about the wine that they are pouring today. Our wonderful experience though is just a result of very hard and painstaking work, let’s not forget at the heart of growing grapes is the farming business. 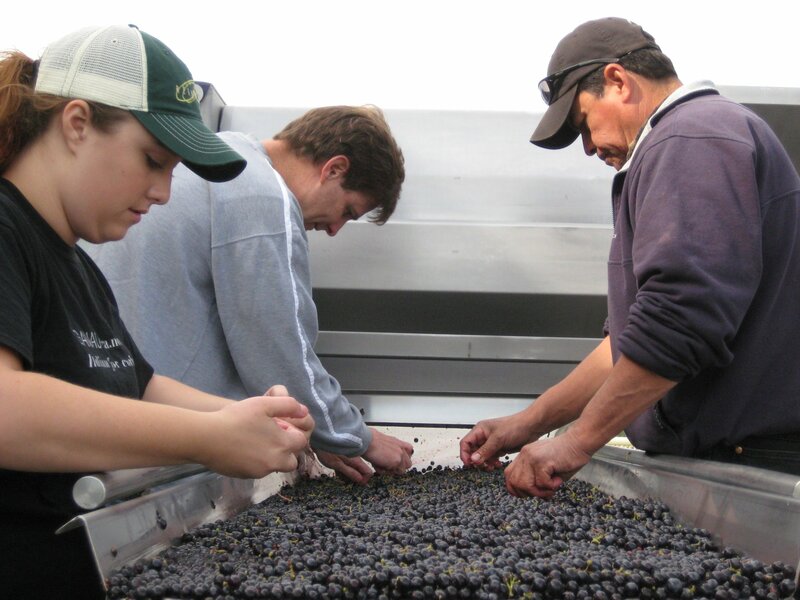 Our good fortune to enjoy great wine is quite literally the fruit of a team of hardworking people’s labor. Today I’m very pleased to be bringing you the story of the Reininger Winery in Walla Walla, Washington. The Reininger Winery, located in the heart of the Walla Walla Valley, Chuck Reininger who is Head Winemaker, specializes in crafting elegant and finely structured red wines from hand-harvested, ultra premium grapes. Enough said I want to taste this wine right now. First let’s take a look at the Walla Walla A.V.A located in the Columbia Valley of Washington State. The Columbia Valley is just a short trip from Western Montana. Glacial Lake Missoula was a prehistoric pro-glacial lake in western Montana that existed periodically at the end of the last ice age. When things warmed up a bit Lake Missoula flooded and took all of its wonderful alluvial soil matter with it to Washington, and in particular to the Walla Walla A.V.A. The Walla Walla area soils are composed of layers of soil blessed with the alluvial soil material and layers of volcanic ash, from eruptions throughout history, and rock that have created amazing soil to grow grapes in. The days are warm to hot and the night air is cool, perfect for growing world class grapes that make fabulous wines. This is what is known as terrior, terrior, terrior at its finest. The Walla Walla A.V.A. was established in 1984 but a group on Italian immigrants began farming this land in the 1850’s. There are presently about 130-140 wineries in this valley, not all are open to the public. This area has become a hotbed of great wineries, which begets great restaurants, and now many very nice bed and breakfast accommodations. Wine does amazing things for great grape growing areas, this story reminds me of the movie “Field of Dreams”, “Build it and They Will Come”. Guess what the wineries have built and the wines lovers, they have come. If you haven’t tasted any wines from the Walla Walla area you must and you will quickly understand why this area is so special. Prior to making high-quality wines in the Walla Walla Valley, Chuck Reininger could be found high atop mountains as a senior climbing guide for a Tacoma based company. 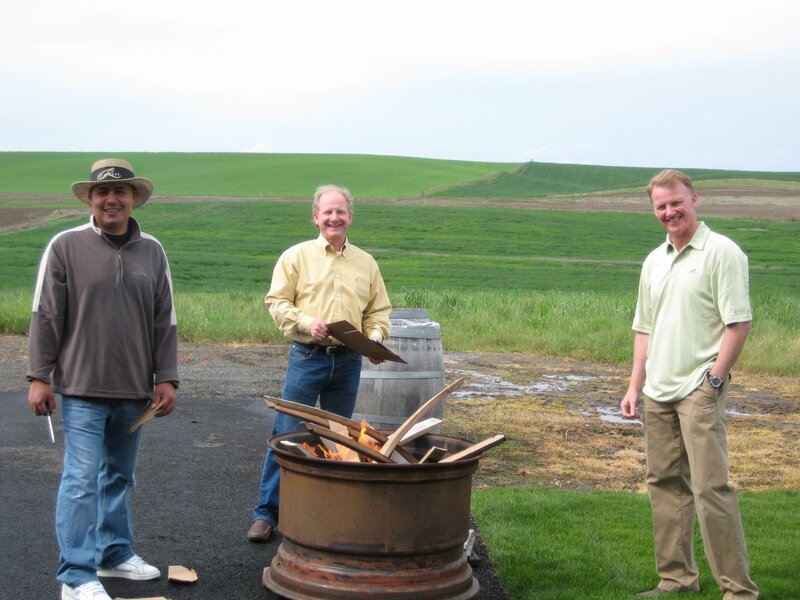 Before moving to Walla Walla, Chuck helped long-time friends with crush at Waterbrook winery. He began experimenting with home winemaking in 1993 and officially caught the “wine bug.” His weekend hobby quickly turned into a dream to produce super-premium wines of his own: “I became obsessed with starting my own winery,” he admits. In 1997, Chuck and Tracy Reininger launched their dream – owning a premiere winery in the Walla Walla Valley. From 1997 through 2004, Reininger Winery was located in a small but functional facility located at the historic Walla Walla Regional Airport. The “shack-teau,” as Chuck and his wife Tracy fondly nicknamed it, was originally designated as a WWII Army Air Corp runway “crash house” and “base theater” where old time crooners and classic films entertained troops. 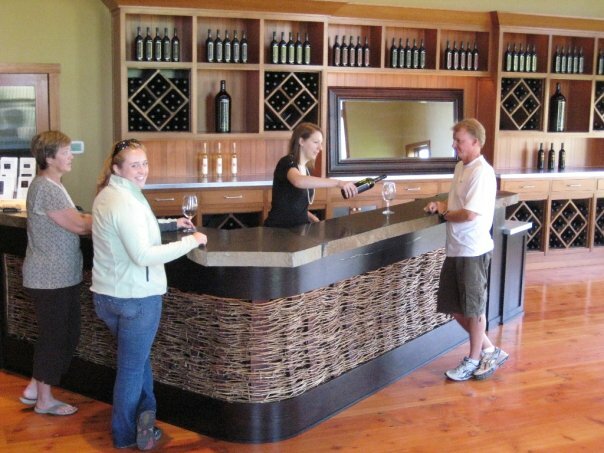 In 2003, Reininger Winery purchased seven acres of land, located six miles west of Walla Walla, adjacent to Highway 12, and began renovating two pre-existing potato sheds into a remodeled 15,000 square foot winery, complete with production facility, administrative offices, and a spacious new tasting room. The result is a modern production facility incorporating rustic design elements that a special place to enjoy events and entertainment. All three of these wines have scored highly with top wine magazines and there team that review them. Here’s what’s important though these wines are extremely well made and are great to drink. The Helix wines are very approachable and affordable for every day and weekend wine gatherings for you and your friends. These wines are simple and wonderful, you don’t have to over think these wines you just drink them and thoroughly enjoy them as I have. Backyard barbeque with friends, that’s what I’m talking about. These wines are a beautiful expression of fruit from the Columbia Valley, Chuck has done an outstanding job with this label across the board or in the case the flight. The Helix 2007 Pomotia is a blend of 38% Syrah, 25% Cabernet Sauvignon, 24% Merlot, and 13% Cabernet Franc; Voluptuous dark ripe fruit of cherries and plums bathing in a tub of chocolate with French vanilla coffee beans and a eucalyptus leaf floating on top. Now let’s get serious with the 2006 Reininger Merlot from the Walla Walla Valley. I’m going to be a bit crass here for a moment because I cannot help myself, Chuck this is freaking great juice dude. Wow this wine is focused; dust, earth, smooth, fruit, smoke, spice, white pepper, structure, perfect balance, beautiful tannin, length, finish, and great acid that make me want to grill up a steak on the barbie right now to enjoy this wine masterpiece with. Chuck do you think I like the 2006 Reininger Merlot? When I emptied the bottle I picked it up when no one was looking and tried to get a few extra drops on to my lusting palate. All kidding aside this is a wonderful winery with an incredible winemaker, and a great tasting room to visit. You don’t want to miss this winery and you certainly don’t want to miss out on anything Chuck Reininger puts into a bottle. This week on the WineGuyMike™ Radio Show© I’m talking with a man who I truly admire. From the very moment I began reading about John Komes I knew there was a great story that would ensue. Today I’m going to share that story with you; this is a story about entrepreneurial Americana that resonates very deeply with me. As we say in my Italian family the Komes clan is all about La Famiglia. Let’s turn back the clock nearly seven decades and talk a little bit about how this incredible wine story even came to be. John Komes’s Father Jerry was the President of the Bechtel Corporation. The Bechtel Corporation who is a giant in the construction industry is headquartered in the San Francisco Bay area. John’s Mother Flora was born in Hawaii and moved to the San Francisco Bay area after finishing high school in order to attend nursing school. It was here that Jerry and Flora first met when they were set up on a blind date. This is where it all began but Flora insisted on getting her nursing degree and securing gainful employment before she would consent to marriage even though Jerry knew that she was “the one”. Jerry and Flora accomplished great things together as a team including a family of three children, eight grandchildren, and fifteen great-grandchildren. 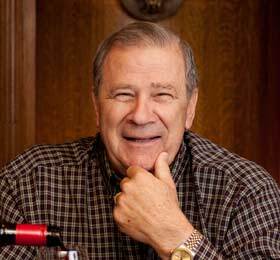 In the mid-seventies Jerry retired from the Bechtel Corporation to the Napa Valley. A few of Jerry’s friends had bought places there so Jerry and Flora found a property there that was an old abandoned winery or as it is referred to as a “Ghost Winery”. The winery originally dates back to the 19thCentury. This amazing wine property has natural springs that have never ceased to flow. Flora Komes turns 100 in November and it just makes me wonder if she found the “Fountain of Youth” in the Napa Valley at the Flora Springs Estate??? Why is that wine so good, could it be the water? Flora attributes her health and longevity to the Merlot though. Jerry passed at the age of 89 after 67 years of team work and marriage to Flora. This couple really set a great example of love, respect, and hard work. John Komes following in his Father’s footsteps built a very successful construction business in the East Bay area of San Francisco. John like his Father has a thirst for life and knowledge so anything he is interested you know he is going to learn it, own it, and execute it. Yeah that’s what we call an entrepreneur in America, and that’s exactly what John Komes is. Flora Springs Winery was founded in 1978. 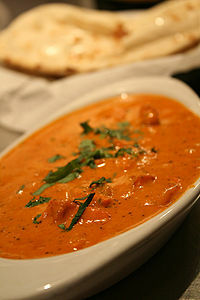 It is located in the Rutherford Appellation right in the heart of the Napa Valley. In the early 1970’s John’s wife Carrie sent him to a wine appreciation class as a gift. John who really didn’t know much about wine at this point in his life was soon making wine at home. Once John develops an interest in something he latches on to it, learns as much as he can about it by studying, listening, and then doing. That’s right John took one look at the property Jerry and Flora purchased in 1977 and the light bulb lit up. Can you say winery? 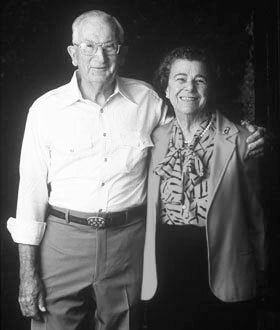 John can and with his wife, parents, sister and brother-in-law Flora Springs Winery was founded. 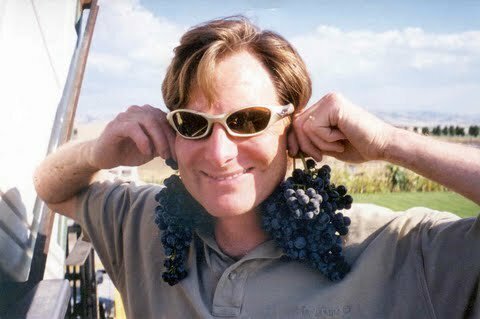 John moved his successful construction business to the Napa Valley where he specialized in construction and restoration of wine properties. The business demands of Flora Springs soon required his full attention so John focused 100% on the winery. He rebuilt, restored, and constructed all of the estate buildings and turned two abandoned cellars into wine facilities. He also built wine caves to age the Flora Springs wines. 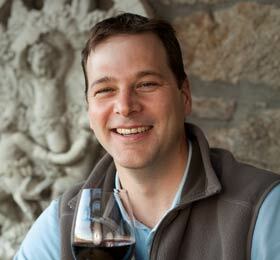 John oversees all aspects of the winery from wine production, to sales, and marketing. But John did not do this alone which is the other piece of this wine story that I find so intriguing. Meet Julie Komes Garvey and Pat Garvey, John’s sister and brother-in-law. One person didn’t build Rome and John being the entrepreneur and visionary that he is realized good help when he seen it. Knowing all about family business I’m guessing the price for that help at the time was right too, ah start-up companies, sweat equity, well you get my point. 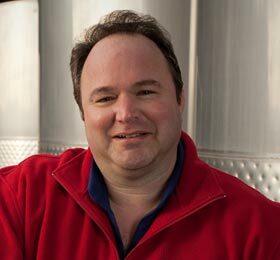 Let’s meet Pat Garvey, Founder, Owner, and Vineyard Director. In 1978 Pat traded his Master’s Degree in Psychology and Counseling from the University of Santa Clara for a tractor – and the opportunity to launch a world-class Napa Valley winery with his wife, Julie Garvey, and his brother-in-law John Komes. While Flora Springs started as a fledgling family business nearly three decades ago, today the Komes and Garvey families own and manage more vineyard acres , 650 in all, than most family-owned and managed vineyard holders in the Napa Valley. As Vineyard Director for all of Flora Springs’ vineyards since its inception, Pat has not only taken the responsibility to remain an innovator with meticulous farming practices to create world-class wines; he has done so with the overarching premise of stewardship and family values: all of Flora Springs’ vineyards are 100% sustainable. 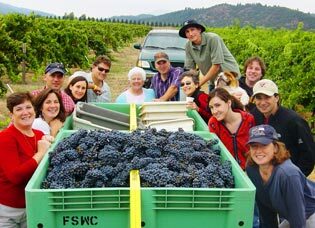 Under Pat’s watch Flora Springs’ vineyards has received organic certification in 2008 from the California Certified Organic Farmers for 20% (120 acres) of Flora Springs’ vineyards. An additional 240 acres were certified in 2010. Sustainable practices include using manures from local chicken and turkey ranches, seasoned in the weather and then incorporated into the vineyards; planting cover crops that enrich the soil and provide habitat for beneficial bugs rather than spraying to eradicate troublesome bugs; and controlling water absorption by planting competing crops to absorb excess water in wetter soils. 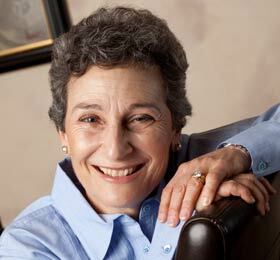 Pat was also instrumental in getting Oakville and Rutherford recognized as sub-appellations in the Napa Valley. The Komes and Garvey families are true caregivers of the land they farm. Terrior is extremely important to this family and every wine they produce is crafted to express the beauty, the unique soils, and the microclimate of their respective vineyard sites. Flora Springs’ now owns 650 acres of vineyards throughout the Napa Valley, including some of the region’s most coveted sub-appellations. 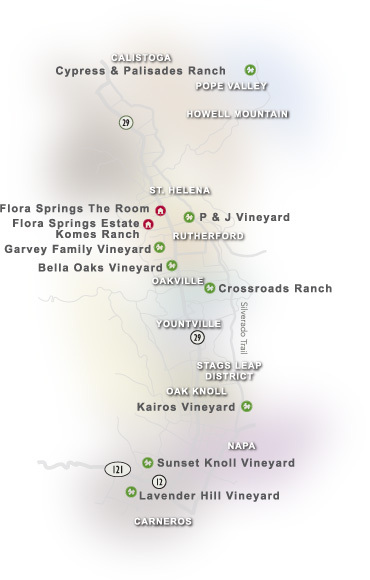 These include Rutherford, St. Helena, Oakville and Carneros. Since the very beginning Flora Springs has incorporated sustainable farming practices in their vineyards. 360 acres of their vineyards are now certified-organic, that’s close to 40% of our estate vineyards, and accounts for nearly all of the grapes that go into their red wines. 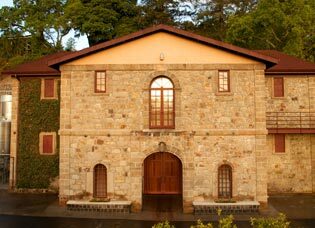 Today the historical estate blends charm with state-of-the-art winery production techniques and environmentally conscious technology. Inside the stone walls of our century old winery you will find specifically tailored stainless steel and concrete fermenters sized to match the blocks on each of their estate vineyards. Beyond the stone archway of the cellar lays 1,000 linear feet of caves. Carved in to the hillside, they provide an ideal and energy efficient environment for aging the Flora Springs wines. 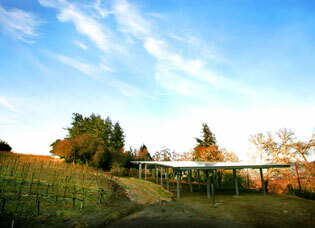 The winery has installed 6,500 square feet of solar panels their most ambitious globally conscious upgrade yet. Paul Steinauer, senior winemaker, and co-proprietor and vineyard director Pat Garvey, are committed to growing and hand crafting artisan wines that can be enjoyed young and vibrant or cellared and graceful. 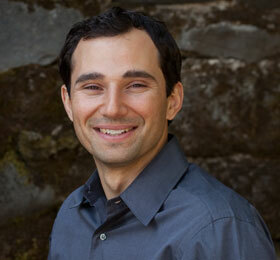 “The synergy they’ve created between the vineyard and winery is critical to Flora Springs wine producing success. Sean Garvey has also followed in his Father’s footsteps as Vineyard Foreman. Sean formerly managed sales for Flora Springs on the east coast, then communications and production, now as Vineyard Foreman he works with his father in the Vineyard Department. His studies abroad in the Basque Region of Spain brought home the importance of food and wine in making connections with people. When I spoke with John this week I learned a lot about the dedication to producing great wines that is Flora Springs Winery commitment to the wine consumer. Flora Springs has 35 years of experience in growing grapes in their vineyards and as John kiddingly said to me he has a name for every vine grown in the vineyards. All kidding aside Flora Springs now knows every corner of their land: how the light falls in late August, where the soils change, and which vineyard blocks ripen earliest. This identity of site dictates how they farm, and in turn, how they make the wine. This respect of identity allows them to craft elegant and powerful wines that reflect the place from which they originate. The Flora Springs Signature wines, Trilogy, Sauvignon Blanc “Soliloquy Vineyard” and Barrel Fermented Chardonnay are wines people tell stories over and tell stories about. Some bottles find their way into the cellars of exclusive restaurants and private libraries while others quickly become unforgettable memories. The 2007 exhibits the entire classic Trilogy attributes with a lovely cassis and cherry bouquet as well as huge black fruit flavors that envelope the palate. 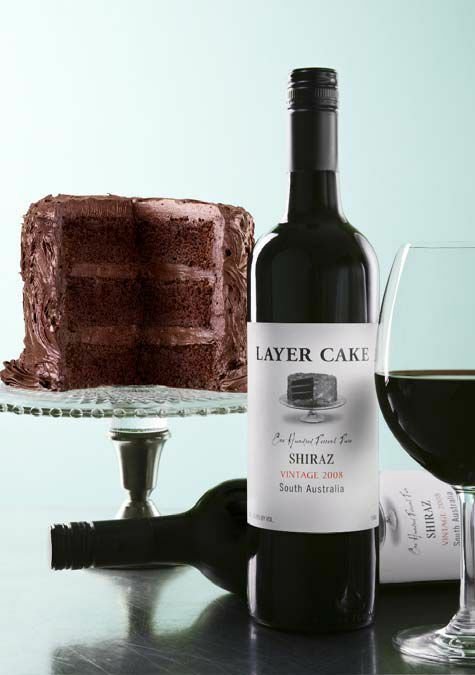 Each varietal is vital to the outcome – the Cabernet exhibits black cherry and dark cocoa character, while the Merlot carries these flavors to the back of the palate for an everlasting finish. Unrelenting with power and grace, the 2007 Trilogy, their 23rd release, beautifully marries the complexity and elegance of their earlier vintages with the sheer bravado of our favorite vintages during the late 90’s. Their Crossroads Vineyard in the heart of the Oakville appellation is a crown jewel in our collection of Napa Valley vineyards. Though Crossroads is planted mostly to Cabernet Sauvignon and Chardonnay, two blocks of the vineyard are devoted to a varietal they absolutely cherish – Sauvignon Blanc. Soliloquy Vineyard in Oakville is the fruit source for their very unique Sauvignon Blanc. From two different clones – one certified by UC Davis as the “Soliloquy” Sauvignon Blanc clone, and the other the Sauvignon Musqué clone – they have created one wine of singular distinction. Flora Springs Barrel Fermented Chardonnay is Napa Valley history in a bottle. In 1980, at a time when Chardonnay was the true ambassador for wines from the New World, Flora Springs began its reign as one of the great Chardonnay producers from Napa Valley. Disregarding trends, Flora Springs continues to craft its Barrel Fermented Chardonnay in a style that has inspired white wine producers and created loyal Chardonnay connoisseurs for the last 30 years. 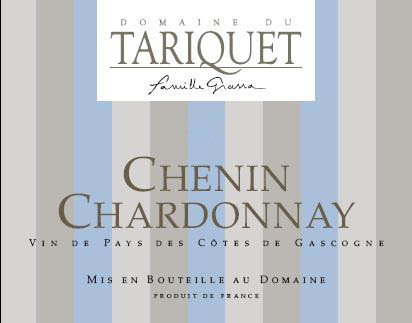 The 2009 vintage offers rich flavors of peach and pear with a hint of pineapple on the palate. In each vintage, they strive to find a balance between the rich flavors of our St. Helena and Oakville Chardonnay and the acidity and minerality of our Carneros fruit. 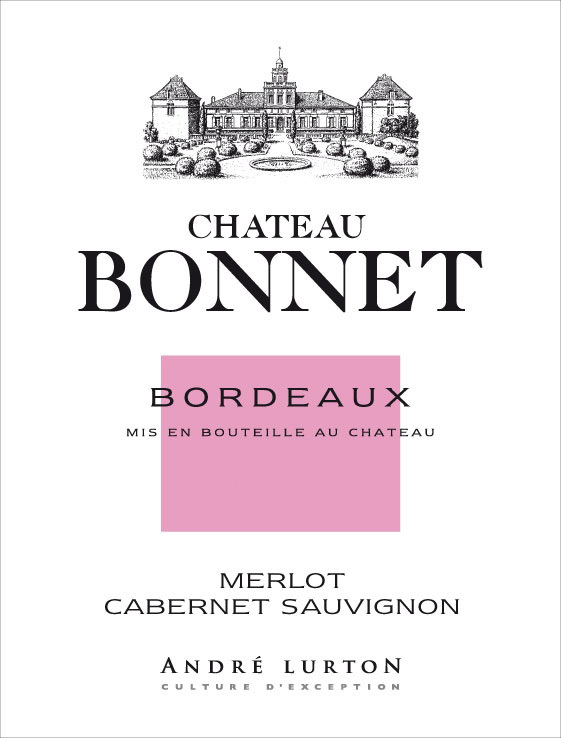 For 2009 they have further enhanced the wine by allowing 21% of the blend to go through malolactic fermentation. You wouldn’t believe the excitement in the cellar when the final blend was passed around the table—tropical fruit, richness, complexity, spandex?—it’s 1980 all over again! The Flora Springs name has become synonymous with perfectly balanced wines. Look no further than their Napa Valley Cabernet Sauvignon and Merlot for great examples of hand crafted artisan wines that express both subtle nuances and bold Napa Valley fruit. This classic Napa Valley Cabernet Sauvignon is ripe with flavors of black cherry and cocoa envelop the front of the mouth and move across the palate into a soft lingering finish. Each vintage they look to reveal the true character of our estate vineyards while using oak as an undertone, highlighting the inherent flavors. The Napa Valley Merlot is a favorite among seekers of soft, supple red wines ready to drink from the get go. 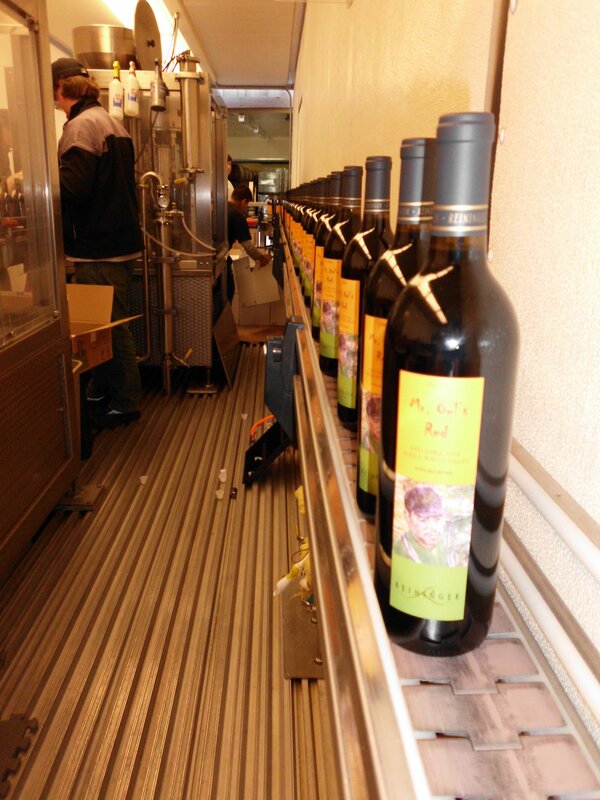 To celebrate the “born ready” exuberance of our Merlot, they’ve bottled it with a Stelvin closure. The 2008 vintage shows full fruit characteristics of strawberry and cherry, with a hint of raspberry and spice. It is so impressive in talking with John Komes and the inspiration from Flora Komes and the upcoming celebration in November of her 100 years of life. Like any family business I’m sure there are trying times but on the whole these families from generation to generation have mentored one another with obvious love and respect. The result is what happens in the bottle because they are caregivers of the land, servants of their community, a family and team that love what they do. They make amazing wine that they share with you and I. By the way I would be remiss in not mentioning that John Komes would like you and I to take a moment to send a card and note to Flora on her 100th Birthday on November 7th. John thank you for taking time to be a guest on my show. I have tremendous respect for all that you have created and your visionary approach, style, and leadership. Cheers to you my friend!